Shikatani Lacroix has won a Silver APEX Award at the Digital Signage Expo (DSE) for its work with strategic branding consultancy MetaThink to develop engaging customer-facing content and interactive technology for China Zheshang Bank. This award celebrates innovative digital displays, interactive technology and compelling viewer content for B2C and B2B companies. Shikatani Lacroix came in second place from a total of 24 entrants in the Retail category, selected by an independent panel of 10 industry experts and journalists. The award was presented at the DSE 2017 APEX awards gala on Wednesday, March 29 in Las Vegas, Nevada. Shikatani Lacroix pioneered the blending of augmented reality, virtual reality and neuroscience to test multiple concepts and understand how consumers emotionally responded to different designs. 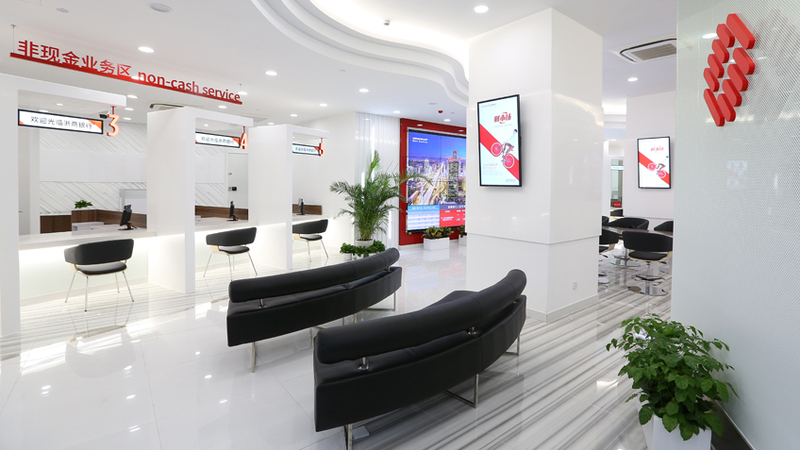 These results were used to refine and create a vibrant new bank branch with integrated digital experiences to engage visitors and help them navigate the space. Customers can choose to learn more about the bank at a digital education zone with curved screens and gesture-controlled interactivity or they can engage directly with a virtual banking concierge. These innovative features contribute to a unique and unforgettable branch experience for all CZ customers. DSE is the world’s largest conference and trade show dedicated to innovative digital communication and technology solutions. The APEX Awards celebrate innovative work in this field in nine different categories. This year’s winners were selected from 138 entrants in 12 countries.